The mountain landscape changes throughout the year and each season offer guests a different and breathtaking view. And, our luxury cabins offer the ideal accommodations to have fun in the Helen regardless of when you visit. Let’s explore what each season of the year has to offer, starting with winter. When you live in a warmer climate, the beauty of a snowier region can seem very exotic.The only question is, where can you find a winter wonderland that isn't too far away or too expensive? Though you may not have realized it, you can enjoy some quality time in the snow without ever leaving the South! North Georgia provides the perfect escape for those who need a break from the sunshine and want to enjoy the glorious snow-capped mountains and all of the fun activities that come with it. Since Helen will reconnect you with an Alpine town, winter might be the most picturesque season to visit. The brick streets may be dusted with snow, the barren trees let the warm sun rays through, and you'll hear the crunch of leaves under your feet as you enjoy outdoor activities. There are plenty of things to do and see that will bring you some extra holiday cheer while allowing you to connect with your loved ones. Whether you are looking or a unique way to celebrate the holidays or are traveling to see family in northern Georgia, you can rest assured that you will enjoy the magic of the Christmas season when you stay in one of the luxurious Helen cabin rentals. Are the winter blues getting you down? Enjoy the beautiful side of the cold season with a stay in a Helen cabin rental. There’s nothing quite like the sight of brilliant white snow in the mountains, which you’ll appreciate every single day during your getaway. What’s more, you’ll be able to take in this gorgeous view while getting cozy in one of the best rentals Helen offers. Many cabins come with acres of private land, so all the winter wonderland you see is yours and your family's to enjoy together. After a long and fun day in the snow, there’s nothing better than stepping into your warm cabin and shedding yourself of your wet coat, chilly boots, and iced over gloves. Grab a few logs and toss them into the fireplace to warm everyone up. Spend the rest of the evening just relaxing and enjoying your cabin. Cover yourself up with a blanket, curl up with a book, or play a game with your family. Many cabins have large windows that help you fully appreciate the wintery nature while you're comfortable and warm inside your cabin. You could even spend a whole day inside your cabin, just watching the snow fall outside of the windows of your cabin rental in Helen GA. Warm yourself up even more by hopping in your hot tub. Break out a bottle of wine and relax completely even when it's freezing outside. What about you? What do you do when it’s cold outside? 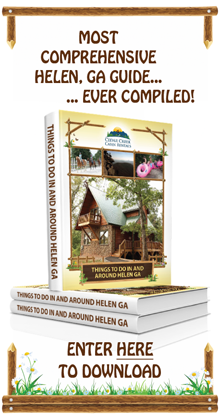 What would you love to do during a vacation in Helen, GA in a cabin rental? Also, renting a cabin allows you the perfect opportunity to get into the spirit of Christmas and come together. You can bake holiday cookies and candies and even cook up a gourmet Christmas meal right in your private kitchen. Enjoy a holiday movie on your big screen TV, spend an evening of conversation in front of a crackling fire while sipping on cider, or just get some much needed R&R in the hot tub. Another great way to take in the winter from the comfort of the cabins is by booking a stay in Bear Creek. This charming rental has access to its own private creek, which in the right weather conditions may freeze over and provide a breathtaking and sparkling body of ice. It also features stellar views of a peaceful wintertime forest from each room, as well as a large deck spanning the whole home. Feeling chilly? Curl up around the cabin's own fireplace as you share drinks with friends and family. As the name implies, this cabin provides beautiful views for all who choose to stay here. From your deck, you will be able to see for miles into the distance, overlooking vast forests and enjoying the sights of snow-capped mountains beyond. Whether you just need a getaway with your immediate family or are planning a large family reunion, our portfolio of cabins will accommodate your needs. While you're visiting the Helen, Georgia area, and want to explore or have a fun time, here is a list of our recommended activities for the winter season. When you think of hiking and taking pleasure in Mother Nature, you might visualize doing so when all is in bloom and it’s warm outside. But why? The sights in nature during the winter season can be just as beautiful. If you grew up in an area where it doesn’t get very cold, you’re in for a treat when you stay in Helen during the winter. Take a hike through the mountains after a recent snowfall to see how the white snow gleams everywhere and look for animal tracks in the snow. Go on a sleigh ride or even a horseback ride to enjoy the wintery environment without getting much snow in your boots. Consider visiting the famous waterfalls in the area and relieve in the experience of knowing that nature continues to thrive even when it’s chilly everywhere. The state parks are great places to visit, especially during the wintertime. Attend the annual fireside craft/art show at Unicoi State Park, learn about beekeeping at Smithgall Woods State Park, and get close and personal with birds of prey at the Amicalola Falls State Park. Just be sure to pack plenty of warm clothes, so that you’ll feel comfortable no matter how long you stay outside. Because you’ll want to stay in nature as long as you can. The quaint little alpine village of Helen is in love with the holiday season! The town's main street is fully decorated for Christmas, with each storefront illuminated by beautiful holiday lights, holiday garlands on the old fashioned street lamps, lavishly decorated Christmas trees, and wreaths and ornaments as far as the eye can see. You will feel as though you have stepped into the magical world of the North Pole! Of course you don't want to skip out on the Helen Christmas Shoppe! This fun, holiday themed store will bring up warm memories from the moment you see it, as the exterior is decorated with a Santa figurine, his sleigh, and more! Once inside you will enjoy the wintry scene of a festively decorated shop that is made to resemble a family home during the holidays as you browse through Christmas figurines, ornaments, and other holiday decor. Maybe you'll even feel inspired to pick up a few things and decorate your cabin for the duration of your stay! This annual event is held at Unicoi State Park and is free to the public. Come and enjoy vendor booths and displays by local artisans from the towns surrounding the park. Artistic and craft mediums include photography, pottery, painting, gift baskets, upcycling, and jewelry. Another magical holiday experience to enjoy is a trip to the Amicalola Deer Park. Every weekend until Christmas, you and your family will be able to visit Santa and all of his "rein"deer at the park. You will be delighted as you are given the opportunity to ride on a sleigh-hay ride to Santa's cabin where you will watch your children feed the deer and take a picture with the big man himself. Grab your group and head to Scaly Mountain for a day of playing in the snow! Located just a short drive from your luxury cabin, you will have a blast tubing down the mountain. Even if mother nature has not graced the mountain with enough snow for tubing, the outdoor center is capable of blowing artificial snow in order to keep you slipping and sliding with your family and friends. See how fast you can go and challenge your loved once to a race! Whatever you do, remember to bundle up because it will be chilly! While you could easily enjoy your entire holiday celebration in the cabins, the surrounding areas of Northern Georgia offer a wide range of activities and festivities to enhance your holiday stay. Most of the mountain towns hold holiday parades, markets and bazaars, and tree lighting ceremonies. Check out these fun and festive activities. The annual Lighting of the Village in the Bavarian town of Helen complete with a visit from Santa Claus. The Helen, GA Annual Christmas Parade and Christmas in the Mountains Celebration are also held annually. The annual Festival of Trees at Unicoi State Park. Ride the Santa Express on the Blue Ridge Scenic Railway from Thanksgiving through Christmas. Don't miss out on the holiday fun in Northern Georgia. Whether you take part in the many activities and festivities or just enjoy the perfect accommodations of Northern GA, you will make holiday memories to last a lifetime. If you're willing to head over to Dahlonega, we've got a few more activities to explore. Just a short jaunt away from the cabins in Helen is the city of Dahlonega. Most famous for its Gold Rush History, Dahlonega is also the home to the annual Old Fashioned Christmas celebration which runs from November through December annually. A festively decorated town square featuring magnificent light and tree displays will allow you to experience the joy and magic of the season with your nearest and dearest. You can expect to hear live Christmas music as the square features carolers on a daily basis. Your kids won't need to worry that Santa won't be able to find them at your cabin rental - you can take them to visit Old Saint Nick every Saturday and Sunday afternoon so that they can give him the directions that he needs. The Old Fashioned Christmas also boasts old fashioned trolley rides through the town, as well as horse-drawn carriage rides. With new life being born all around and plants returning to bloom, northern Georgia is truly a sight to behold in the Spring. Being outdoors in nature is relaxing and restores the soul. The quiet sounds of area waterfalls, sitting around the campfire at night and walks through the woods along a nature trail are all ways to relax and rejuvenate. As the birds start their song anew and buds appear on the trees quietly transforms to a springtime retreat. Whether solitude and quiet is the goal of the vacation, or active, outdoor adventures are desired, spending spring break at a luxury mountain cabin is something most students don't think about. With hiking trails, horseback riding, mountain climbing, tubing and panning for gold, a vacation out in the wilderness is a great spring break adventure to think about. The average person has difficulty dealing with the stress of every day life. Unplug from technology and take time to sit back and breathe. Go for a walk without being interrupted by a cell phone and go mountain climbing for the pure joy of it. Learning how to mountain climb or ride a horse will create more memories of spring break than any average beach vacation. It's all about balance when a spring break is planned and all the comforts of home are here minus the distractions of work. Being stressed out can cause headaches, body aches, anxiety and depression. Planning a vacation out in the fresh air is a positive step to gaining back a healthy outlook on life. Enjoy cooking both indoors and out when you stay at a cabin out in the woods. With all the amenities of home, luxury cabins come with outdoor fire pits, full kitchens, hot tubs and BBQ grills. Surrounded by nature in the middle of the woods, the pure relaxation found in the luxury cabins is unmatched by almost anywhere. With an outdoor vacation, it's all about enjoying the time without feeling rushed. Listening to the birds chirp in the morning while sipping a steaming mug of coffee seems to put all things back into perspective. Relax, renew and rejuvenate with a vacation out in the middle of the North Georgia Mountains. If you're looking for some things to do in the spring time, we've got the following curated list for you. What better time of year to experience the beauty of Anna Ruby Falls than during the spring? The hike to Anna Ruby Falls is one of the most iconic outdoor activities in North Georgia. As the snow melts from the mountains, this majestic dual waterfall will be thundering down harder than ever. As you hike down the paved Anna Ruby Falls Trail to the viewing platform, you will also be greeted by numerous opportunities to spot newborn wildlife and enjoy the plants coming alive all around you. Located near Unicoi State Park, the falls are accessible via a paved half mile trail. When your horseback riding in north Georgia, you'll enjoy the beauty of spring in an up close and personal kind of way as you ride through the Chattahoochee National Forest. Riders of all levels of expertise are able to enjoy the day enjoying the cool spring air and taking in the sights all around. Maybe if you are lucky you will spot some newborn animals! Visiting Georgia's highest point during the spring is a great idea! Why, you ask? After a gorgeous drive to the top of Richard B. Russell Scenic Highway, you will be required to either hike or take a shuttle to the peak of the mountain in order to look down upon the world. The springtime air will offer the perfect conditions for enjoying a leisurely (and free!) hike to the peak of Brasstown Bald where you will be able to see four states at once: Georgia, Tennessee, North Carolina, and South Carolina. Located in nearby Cleveland, the North Georgia Zoo is the perfect place to spot the area's newest residents. Many animals give birth each Spring at the zoo and there are special programs available to celebrate their arrival. You can choose from standard admission or indulge your wild side with a specially created zoo excursion including the incredibly popular Kangaroo Encounter. Thankfully, there’s no mall nearby, although there is a Wal-Mart in Cleveland. But a big chunk of the retailers in Helen are all local. There are more than 200 vendors of handicrafts, gifts, home décor, toys, and even a couple of Christmas stores that are fun to browse all year round. There are also art galleries featuring talented local visual artists to appreciate as well, one-of-a-kind jewelry, pottery and more. All that sightseeing will soon be bringing on the hunger, so it’s convenient that there are dozens of tasty offerings, from fine dining restaurants to great places to start your day with a hearty breakfast. Summer is the time of year when families agonize on where to go for summer vacations and what to do. The kids will have a large stake in the choice. What is fun for them, keeps them busy, lets you kick back and is safe? Those that live in Georgia are in luck. Just over an hour from Atlanta you will be in a different world. The trees are lush and green, the warm summer sun shines in abundance, and the mountain views are breathtaking against a clear blue sky. Imagine waking up to drink your coffee on the back porch while you watch the wild birds pick at the morning grass covered in dew. Or consider the family fun available as you toast marshmallows around the cabin's fire pit as the sun sets on another gorgeous North Georgia day. The average high temperature for the Helen area in the summer months is 86 degrees. The record high was 100 degrees in the summer of 1986. The average low temperature is 63 degrees. The record low for the summer months was 36 degrees in 1969. The average precipitation level is approximately 5.5 inches per month during the summer season. June 21 is the summer equinox and will provide the most amount of daylight for the entire year. The sun will rise at 6:27 am and will set at 8:51 pm for a total of 14 hours and 24 minutes of daylight. Click here to see what is the weather in Helen right now. Renting one of our many cabins in North Georgia is a great choice year round, but the summer months offer guests a truly beautiful stay. Whether you are hoping to steal off for a quick weekend getaway, or are planning a week-long trip, you'll find that it's easy to plan your dream vacation on a budget that you can afford. You're hanging around in your mountain cabin and the kids are playing pool, walking the trails, hanging out on the playground, and roasting marshmallows at the campfire. If you think that you have to be an "outdoorsy" person in order to enjoy a cabin stay, guess again! Although outdoors enthusiasts do enjoy staying in the private and scenic Georgia mountain cabin rentals, even the most finicky of vacationers have fallen in love with the lush accommodations and amenities. This is because the mountain vacation rentals offer the best of both worlds.Those who love to be in the heart of nature will enjoy being surrounded by peaceful wooded glens and all of the plant and animal wildlife that is native to the area. These folks may try blazing their own trail in the forest surrounding their cabin, birding, stargazing, looking for frogs and toads with their children in their own private creek, trading campfire stories around their fire pit, and more. At the same time, city slickers who are more accustomed to the finer things in life will find themselves well taken care of. These mountain rentals aren't the run-down, archaic, or spooky shacks that you may have seen in a horror movie. Our cabins are all climate controlled, feature electricity and hot water, and are very well maintained. The vacation rentals are all equipped with modern kitchens and appliances, and you can even select a cabin with a washer and dryer inside. In addition to all of the standard creature comforts, the cabins provide a number of luxurious amenities like fireplaces, private hot tubs, Jacuzzi baths, flat panel TVs, high-speed internet access, game rooms, and more. You'll feel like you're in a resort - not a cabin. So - what to do next? Explore Helen, GA, of course. Check out the following ideas for things to do in the spring. Regardless of your preferences, there are plenty of things for all personality types to enjoy doing and seeing. For those who love to breathe in that fresh mountain air and be surrounded by the great outdoors, there is a never-ending supply of things to do around the mountains in Georgia. For starters, you may want to go hiking. Unicoi State Park, Smithgall Woods State Park, Brasstown Bald, and a number of other nearby locations offer a wide variety of hiking trails at various skill levels. You'll enjoy spectacular views of the mountains, waterfalls, flora, fauna, and more. Outdoors enthusiasts also tend to enjoy trout fishing on the fully-stocked Chattahoochee River. You can even get a fly-fishing lesson from Unicoi Outfitters. If you have any luck, you will be able to grill up your catch back at your mountain cabin. Want to get out on the water? Visit Wildwood Outfitters to try anything from a peaceful canoe trip, to a wet and wild kayaking adventure on class 2 and class 3 rapids. Families love visiting the Georgia mountain cabin rentals because there's so much to experience together. You are able to take a step back in time by minding for gold and precious stones at nearby Duke's Creek Gold and Ruby Mines, or Consolidated Gold mines. Another great bonding activity is taking a peaceful ride down the Chattahoochee River on an inter-tube. Cool River Tubing Company is located in the heart of Helen, and offers hours and hours of fun. When you're done, you may decide to stop by the Alpine Mini Golf Course and wind down your day with a round of putt-putt and a cool treat. If you're hoping to rekindle a little romance, the Helen, Georgia is just the spot to visit. In addition to supporting a very romantic atmosphere themselves, the vacation rentals are in close proximity to a number of couples-friendly activities. Sweethearts often enjoy taking a tour of Habersham Winery, buying a bottle, and toasting each other as they watch the sun go down from their cabin's hot tub. Other couples may opt to take a private horse-drawn ride through Helen, compliments of the Alpine Carriage Company. Nacoochee Crossing Wellness Center is another popular spot, as couples massages provide the ultimate in relaxation. When you book your trip to the Georgia mountains in the summer months there are many unique recreational opportunities that are unavailable the rest of the year. Make the most of your summer vacation and consider trying something new for a fun North Georgia adventure. Maybe one the following ideas will do! If you are staying in one of the many beautiful rental cabins in North Georgia this Fourth of July, you won't want to miss the Family Celebration and Firecracker Run in Dahlonega. The 5K and 10K runs are a part of a much bigger celebration and kick off a day full of fun activities. You can register online for the 5K, 10K, and Fun Run. Your registration fee includes a technical shirt, course entertainment, and after race festivities. All proceeds from the run go to the cost of Dahlonega's evening fireworks show. The Habersham Community Theater is proud to present a variety of productions each and every year. Tickets can be purchased online for all performances. When it is warm outside, one of the best things to do in northern Georgia is to go for a ride down the Chattahoochee River. Cool River Tubing Company provides the perfect way to enjoy the sights and sounds of Helen, GA; tubing all the while and staying nice and cool in the water. You will also enjoy bonding with your family and friends. Just don't forget your sunblock! Soar through the breathtaking mountains of North Georgia on an exhilarating zipline ride. There are several zipline operators to choose from including Zip n Time, Sunburst Stables, and North Georgia Canopy Tours. Each operator offers different packages and maintains specific requirements. Check online before you make your reservation to ensure you are choosing the perfect tour for your entire group. One of the most lovely times of the year to visit northern Georgia is in the autumn. With a gorgeous backdrop of colorful, changing leaves and the crisp, fresh fall air you will feel total serenity. Here are several of the best things to do in the fall in Northern Georgia. Nothing is more anticipated in Helen, Georgia each year than the annual Oktoberfest celebration. Revelers gather in Helen from across the country to celebrate German cuisine, beer, and culture. There's no denying that Oktoberfest is a major hit for those guests choosing Georgia cabins for rent but there are plenty of other fun things to do during the fall months in Helen. Running from mid-September through the end of October, this Bavarian delight is the largest celebration of its kind in the south. You and your friends or family can devour authentic German cuisine such as strudels, bratwurst, sauerkraut, and ice cold beers. Live music will inspire you to tap your toes and dance in the streets all night long! The weather in North Georgia can be unpredictable in the fall months. You may likely have a day of warm gorgeous sun followed by overcast skies with a chance of rain. Regardless of the weather there are many different antique shops in the Helen area where you can search for treasures. The Nacoochee Village Antique Mall is famous for its eclectic antiques that you can't find anywhere else. Be careful not to get lost in the corn field mazes of Dawsonville, Georgia at Uncle Shucks. The annual attraction is open from September 1 to November 18, Fridays - Sundays. Visit their website to learn more about directions, special events, pricing, and holiday hours. One of the easiest ways to enjoy the fall foliage of northern Georgia is to take a ride aboard the Blue Ridge Scenic Railway. You'll relax as you take in the spectacular sights as the railway takes to to Copperhill, Tennessee and back again. Are you looking for a vacation that is as colorful as you are? One of the reasons that travelers enjoy visiting Helen, GA so much is the myriad of hues there are to enjoy. From the moment that you arrive in Helen, GA, the first thing that you will notice is the brilliant red rooftops throughout the Alpine Village. Each of the quaint shops and restaurants that line Main Street feature Alpine-style architecture and red, peaked roofs that you can see from miles away. The bold hues will lure you in, but you'll stay because of the village's charm. Candy kitchens, specialty shops, and yummy eateries along with the red-roofed Alpine golf-course will keep you entertained all day long. If you plan to visit Helen, GA between May and August, you absolutely cannot miss out on Georgia peach season! These succulent, orange treats are the crowning jewel of northern Georgia. Just a short drive south of Helen, GA you will find Carroll Farms in the small town of Woodbury which grows all varieties of peaches like Correll, Gala, Fireprince, Sunhigh, Summergold, Cresthaven, and many others. Whether you prefer to buy your peaches by the crate or to pick them yourself, you'll walk way with an armload of yummy fruits at the day's end. Not going to be around during peach season? Don't worry. Carroll Farms sells peach preserves, peach butter, and beach salsa all year long. Did you know that the Helen, GA area was the first site of the American gold rush? Visitors travel from all around to try their hands at panning for yellow, glittering gold in the regions many mines like Duke's Creek Gold & Ruby Mines and Consolidated Gold Mines. If you get lucky, you may come across some gold or precious stones that you can have preserved in a souvenir bottle or buffed up by the professionals so it sparkles and shines like new. It's hard to miss all of the beautiful green landscape and trees surrounding Helen, GA! Both visitors and locals love to hike on the many trails located in nearby state parks like Unicoi and Smithgall Woods. Here you will be able to get a close up look at the abundance of green foliage of trees and wildflowers that are native to the area. You may also enjoy going on a zipline tour that allows you to enjoy the green mountains and valleys from a bird's vantage point. For some of the best views of the beautiful scenery, consider visiting Brasstown Bald - the highest point in all of Georgia. The drive along the Richard B. Russell Scenic Highway to Brasstown Bald will take you through emerald trees, and the view from the top will not only afford you a panoramic view of the green earth below, but of four different states: Georgia, Tennessee, North Carolina, and South Carolina. The area around Helen, GA is well known for its blue waters and thundering waterfalls. You will definitely want to visit Anna Ruby Falls at Unicoi State Park, just outside of the Alpine Village. Of course, making the trip over to Amicalola Falls in the Dawsonville area is also a must, as it is the highest cascade east of the Mississippi. In addition to exploring the region's many gorgeous waterfalls, guests also enjoy getting out on the water to go fishing or to enjoy a tubing adventure. The words to "America the Beautiful" describe our country's "purple mountain majesties", but have you ever experienced this breathtaking phenomenon? As the sun sets over your cabin rental, Helen, GA will wow you as the purple silhouettes of the gorgeous northern Georgia, mountain backdrop frames the sky. One great way to view the mountains at sunset is to visit Sunburst Stables and request a three hour sunset ride. Here, you will be able to watch the sun go down over the purple mountains from the highest perch in the area. After a day of exploring the rainbow of Helen, GA, you will be richly rewarded as you relax in one of our luxurious cabin rentals - a true pot of gold. Whether you'd like to end your day by soaking in a hot tub or Jacuzzi, by roasting marshmallows around your fire pit, or watching a movie with your family, the cabins in Helen are Georgia's way of saying, "Thank you" for visiting. Do you prefer the warmer months or the cooler times of the year? When you choose to visit northern GA you will be pleased to find something to do in each and every season. Have you visited North Georgia before? What did you do that was specific to the season? Share your thoughts in the comments below.